A Monumental UK AD & Biogas Approaches - CHP at the Ready! A Monumental UK AD & Biogas Approaches – CHP at the Ready! You might have read last week how the UK celebrated a full day without using its coal-fired power stations. A contributing force behind this would certainly have been the UK’s anaerobic digestion and biogas sector which centres on harnessing the gas produced from a range of anaerobic digestion environments. So as the world of anaerobic digestion and biogas blossoms, this year’s UK AD & Biogas runs alongside the World Biogas Expo 2017 at Birmingham’s NEC over the 5th and 6th July. Although we’ve just over two months until this monumental event, now’s the time to plan your visit to the most senior and global gathering of its kind and to see shentongroup, the UK’s Leading Technical Experts in Standby Power, Uninterruptible Power Supplies and Combined Heat & Power Systems at stand G201. 4000-plus industry leaders will be engaging with AD and biogas products and services from sectors including agriculture, sewage treatment, waste management, transport, heat and power, and for the very first time, separate food waste collection infrastructure, landfill gas and biomethane vehicles. shentongroup has been at the forefront of Combined Heat and Power (CHP) for a number of years now. As the sole UK and Ireland distributor of Tedom CHP systems, we’ll be demonstrating exactly how the dedicated biogas range of Tedom CHP systems use this less-expensive, greener fuel to produce electricity, whilst utilising the heat from the process to deliver hot water for heating and cleaning. If you’re attending UK AD & Biogas 2017, make sure you visit shentongroup at stand G201. To book a time slot with a shentongroup CHP expert, click here! 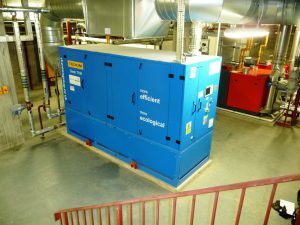 In the meantime, you can learn more about CHP through our two case studies; “When is CHP the right energy choice?” and “Design and operational considerations to get the best performance from CHP systems”.